Roasted balsamic strawberries and I have a very special relationship. We’re sort of inseparable in the summer. And basil? 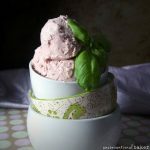 He’s a great friend too… ;) I’ve previously shared a recipe for a balsamic strawberry vegan yogurt on the blog, but this dairy-free ice cream is another favorite around here. Homemade ice cream is one of the best desserts ever — sooo much better than most of the thousand ingredient-laden commercial dairy-free ice creams and it’s actually one of the easiest desserts to adapt for a dairy-free diet, and this no-fuss version is hard to mess up. As for the flavor, strawberries and basil may seem strange to some, but it’s actually a really incredible flavor combination. Make that balsamic strawberries, and it only gets better ;). Pour all ingredients into a blender and process until smooth and creamy. Pour into your ice cream maker bowl and make according to your machine’s instructions. Place in the freezer for a few hours to firm up if you like. Or alternatively pour into a freezer safe container and allow it to freeze naturally, stirring it every 30 minutes of so for the first few hours. I haven’t yet made this ice cream but I’m worried because I’m not a big fan of coconut. 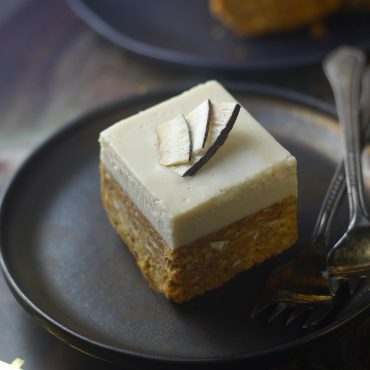 I was wondering if the recipe tastes heavily of coconut or if it’s just a hint and can I switch out the coconut milk for Almond milk? I had quite a bit of juice left in the pan after roasting strawberres. Do I add that also or drain off? Thank you so much, Ginger. I hope your granddaughter enjoyed it :) The basil does add an unexpected freshness. Hi, I am so excited to try this, I am sorta worried about the basil I blended it all but it still had tiny basil pieces, not very pink. Two hand fulls but I hope I did not do too much. I tasted the cream after I blended it, and it does have a fresh taste. Here is hoping little Granddaughter will love it. Thank you, I have enjoy many of your recipes. Hi. I think I made this once. I’m pretty sure it came out really well, but gosh darn it, I’m going to have to make it again tonight to be sure. It’s kind of a tough question to answer, because it depends on your scoop size :) But I’d say more than one scoop per serving — more in the 2 medium scoops category, if that helps give you an idea. hi, do you have any tips for not using coconut milk? since I have tried using it several times and the coconut flavor was too strong at the end. Have difficulties to find vegan ice cream recipes without coconut milk..Although I understand the coconut milk was needed for creamy texture. btw absolutely Love the taste of basil in this recipe! Sorry I missed your question. 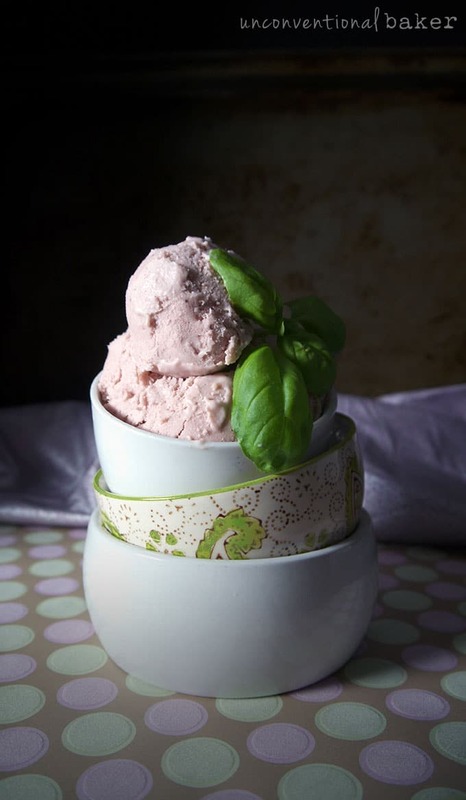 I make a quick strawberry basil banana ice cream version that doesn’t involve coconut milk (like this: https://www.unconventionalbaker.com/recipes/instant-strawberry-banana-ice-cream-recipe/, but with a hint of fresh basil). Otherwise I’d recommend using homemade cashew milk — unstained. You can blend 1 1/2 cups cashews in 3 cups water, and that can work well here. Delicious! Such an awesome flavor combination. The perfect summer treat :) I included all the sauce from the strawberries and skipped the extra maple syrup in the ice cream and it was still sweet enough. Aw, so happy to hear you liked it! :) Thank you for sharing. I loved this, its my new favorite! Im lactose intolerant and I love ice-cream. I received an ice-cream machine for the holidays. 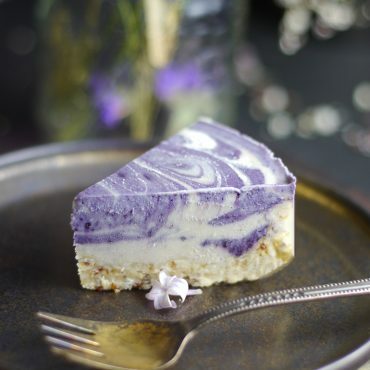 Do you have any more ice-cream recipes like this one? If you do, could you leave a link in a comment. Sorry for the delayed reply — so super happy to hear you enjoyed this! I actually don’t have any other ice cream machine recipes, but I do have loads of delicious blender ice creams to explore. I’ve just found a recipe on how to make homemade coconut milk, going to try this out these days, maybe it’s better then. It’s just curiously that I can have coconut in any form but not in those store bought coconut milks. Berries and balsamic in oven as we speak. When using the berries in the ice cream recipe do you use the extra balsamic that the berries baked or leave it out? Hi Wendi — I do use the sauce as well — it tastes great on ice cream. Yay — you’ll love it! That looks so smooth and creamy, yum! Thanks for linking up to Sweet and Savoury Sunday, stop by and link up again. Have a great day!! Thanks for stopping by, Laura! So glad you like the recipe :) Hope you’re having a lovely weekend! Sure thing :) See you on there! Found your beautiful site via Gluten-Free Friday. Have a great weekend! Wow, this sounds fabulous. Thanks for sharing with Let’s Get Real (I’m co-hosting this week)!